Other Posts have indicated that during the 20th century we experienced an epidemic of deaths from coronary heart disease (CHD). There was a clear onset in about 1924, well defined from national data. There was a dramatic decline after 1970 in the UK, and after 1960 in the USA. This has also been well-defined from even more accurate data. The decline has occurred during my working lifetime, and I have clear memories of its peak incidence in 1970. The years 1967-1970 were important years. The music was exciting and fashions were changing. I had just started work as a doctor. The work was demanding with very long hours (we lived in the hospital and effectively worked all the time), but it was all good fun with a wonderful environment of learning and great camaraderie. Friendships lasted a long time, as did what we learned and the vast clinical experience that we generated. 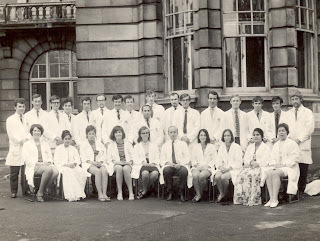 Resident medical staff of the Manchester Royal Infirmary 1970. We saw many patients with rheumatic heart disease – heart failure due disease of the heart valves, in turn the result of rheumatic fever, usually in childhood. New cases were becoming rare, and the existing patients were able to benefit from the very new heart valve replacement surgery. We saw the occasional patient with heart disease resulting from syphilis in earlier life, but this was becoming of historical interest. Perhaps the most important thing that was happening in these years was something of national and indeed of international importance that we did not understand or even think about at the time. We were oblivious to the fact that the 20th century epidemic of coronary heart disease (CHD) had reached its peak and was about to decline. In previous Posts I have presented much of the convincing evidence of the decline of deaths from (CHD) in the UK since the peak in 1967–1970. I have illustrated (in 2013) that in the UK we experienced an epidemic of CHD, and I have also presented details of a similar epidemic in the USA. There are many publications of the data and they all point to the same thing. 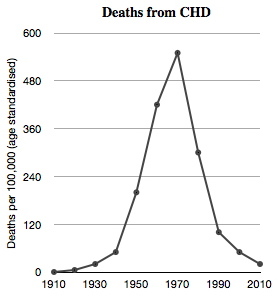 The decline of CHD deaths has been rapid, spontaneous, international, and unexplained. The assumption that medical and public health interventions have been responsible for the decline cannot be correct if we consider the years 1970–1990, the time of the most dramatic decline of deaths. For those of us working in acute medicine in1970, the scene was both dramatic and tragic. 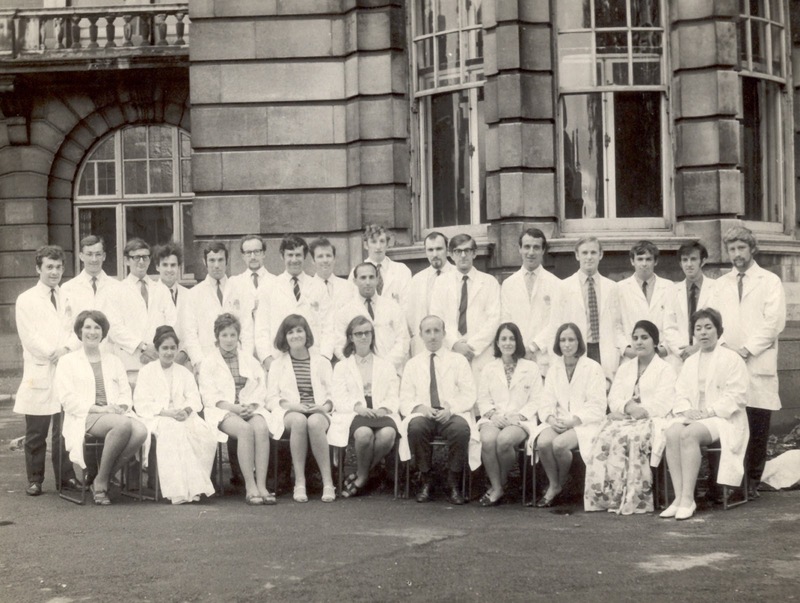 I qualified in medicine in 1966, and in 1970 I was the Resident Medical Officer (RMO) of the Manchester Royal Infirmary, a very busy teaching hospital with a large number of emergency admissions. Every day we would see patients admitted on account of an obvious and severe heart attack, the more precise medical term being myocardial infarction (MI). Myocardial infarction means literally death of heart muscle (myocardium) due to interruption of its blood supply. This is in turn is the result of a blockage of one of the branches of the two coronary arteries (right and left) that supply the heart muscle with blood. 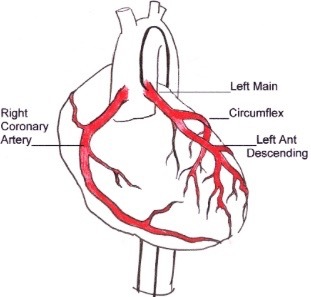 The name "coronary" is given because they form a coronet (crown) around the upper part of the heart. The underlying disease of the coronary arteries is atherosclerosis causing perhaps an 80% obstruction, with a fresh blood clot giving rise to a complete blockage of the artery and subsequent myocardial infarction. Not only would we see the patients presenting as emergencies, but we would see the pathological details in the autopsy room, most of the deceased having experienced sudden death before admission to hospital. 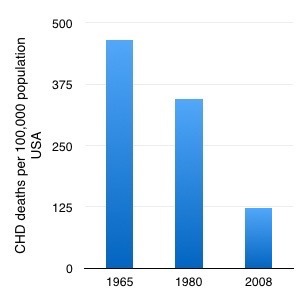 The epidemic of CHD was dramatic and catastrophic. Suddenly and for the first time, heart disease became by far the most common cause of death. Men and women died in their prime. 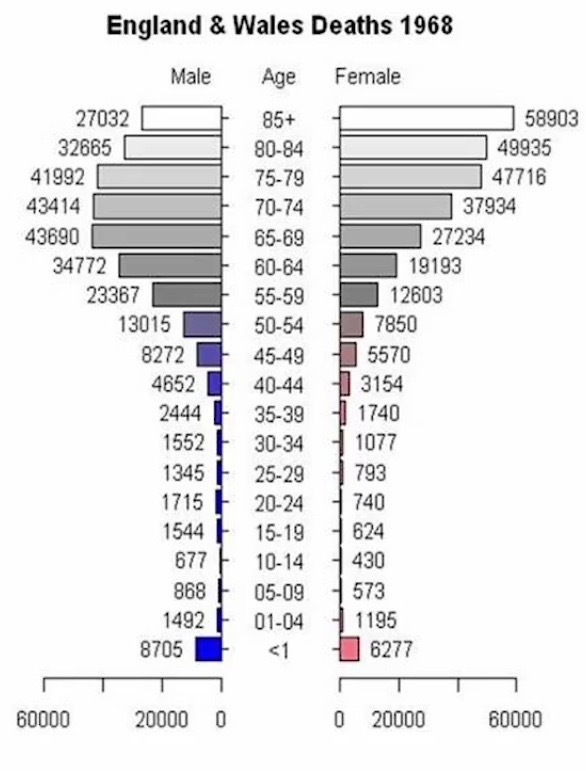 The patients with MI were usually men of working age. They had experienced severe sudden crushing chest pain, and they had usually been in good health previously. They looked very ill, and on immediate examination they were cold and clammy, gasping for breath, and with low blood pressure. The diagnosis was easy but would perform an electrocardiogram (ECG) and this would show dramatic abnormalities, the characteristics of MI. I have provided a more detailed outline of ECG changes in another Post. 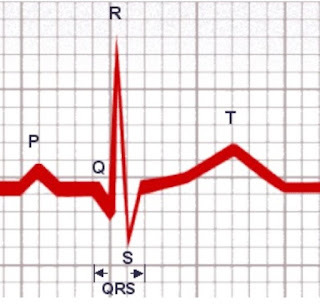 The normal ECG (Figure 3) shows a P wave, representing atrial depolarisation and contraction, a QRS complex, representing venticular depolarisation and contraction (systole), followed by a flat ST segment, and a T wave that represents repolarisation (electrical recovery) of the ventricles. In the many patients with acute MI who we used to see, the ECG changes were not subtle but were very obvious, with indications of serious and extensive damage. We would see immediate ECG abnormalities as shown in Figure 4, namely a small Q wave (initial down-stroke) with high ST segment and large T wave. The changes are so clearly different from the normal ECG in Figure 3. During the few next hours the changes would progress to a deep Q wave, flattening of the ST segment and inversion of the T wave. The loss of the upright R wave and the change to a deep Q wave indicates death of a significant proportion of heart muscle. If a patient had a history of a previous MI, then an ECG abnormality such as in Figure 5 would pose the problem as to whether it would be a historic abnormality or an indication of a recent MI. In this situation the ECG would be of limited value. Another test would be necessary - a blood enzyme test. When heart muscle cells are damaged or die as the immediate result of an MI, proteins leak out of the cells into the blood and there they can be detected and measured. The first of these to be identified was the enzyme creatine kinase (CK-MB), and in the clinical context of chest pain, elevation of its blood level would indicate an MI. But CK-MB also appears in the blood after injury to skeletal muscle, even after an intramuscular injection. The next abnormal blood protein indicator to be identified was troponin, which was more specific for heart muscle. I have described the common problem in 1967–70, a patient with an MI, ECG showing an elevated ST segment, whether or not a Q wave had appeared. This is now called a STEMI, meaning ST Elevation MI. In 1967-1970 the mortality rate at onset of MI was almost 50%, and in those who survived long enough to attend hospital it was about 35%. There were few overall survivors. In addition there are patients with chest pain that sounds like an MI, with the patient not being obviously ill, and in whom the ECG would be normal. Such patients have become increasingly common since 1970, during which time severe MI has become more rare, but health awareness more important and hospital attendance more common. The diagnosis - "ruling in" and "ruling out"
The ECG is not always of definite diagnostic value: an abnormal ECG can "rule in" an MI if the changes are new and appropriate, but it cannot "rule out" an MI if it is normal. This is a common problem with many medical tests, including X-rays and scans. In this case we find that the ECG has "high specificity" (no false positives – if a positive ECG then a certain diagnosis) but "low sensitivity" (many false negatives – a ECG might be normal in the presence of MI). 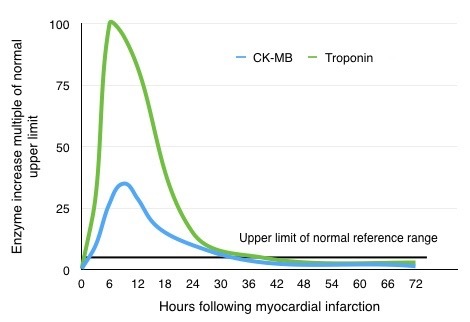 The troponin test is more specific of MI than is CK (fewer false positives) but it also more sensitive, meaning that more MIs are diagnosed. In more recent years the troponin test has been replaced by the high-sensitivity troponin-T (HsT) test. This is even more sensitive and so even more people with chest pain and a normal ECG are now diagnosed with MI (NSTEMI) than would have been the case in the past. Does this matter? In the past a large numbers of people with chest pain, normal ECG and normal CK or troponin would have left hospital with a diagnosis of “Chest pain ? cause”. Research has shown that such people would have an excellent outlook with a low risk of death or MI in the next few years . Some of these people are now likely to receive a diagnosis of MI (NSTEMI). The definition of MI has clearly changed in the 21st century and so changes in the incidence of MI are far from clear. We should only compare like with like. The change in diagnostic criteria of MI will inevitably increase the number of people diagnosed, what is called "disease creep", or "patient mongering". What is clear is that the number of deaths from MI and CHD have declined enormously. This is of the greatest importance, as death has been the major effect of MI and CHD, and the definition of death has fortunately not changed ! In 1970 sudden death was a major manifestation of MI, perhaps more common than chest pain. Those who survived to be admitted to hospital were still at great risk of death. It is scarcely believable now that patients with MI had a hospital mortality rate of about 35%. The death rate dropped rapidly from the hectic days of 1970, probably due to a combination of new medical interventions but mainly because the disease became much more mild. 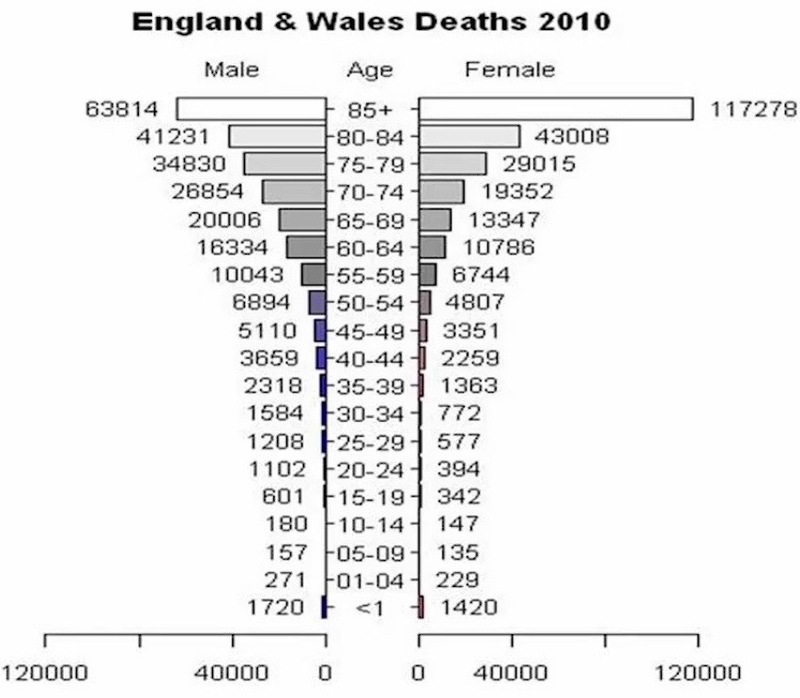 We can see in Figure 5 the reducing mortality rate, and also the higher mortality rate in the older age-group . There were two reasons for death. One was that such a large part of the heart muscle was irreversibly damaged and so the heart could not function adequately to sustain life. This was left ventricular failure (LVF) or cardiogenic shock. Once common, this is now rare. Unfortunately heart muscle cannot regenerate. The other is “cardiac arrest”, well known to all. Sometimes the heart has stopped completely (cardiac standstill, or asystole). More common is ventricular fibrillation – the heart is shimmering with no no co-ordinated contraction, no function and no beat. This can however be reversed by electric shock - defibrillation - which co-ordinates the contraction of muscle fibres of the heart. It can but might not always restore the normal rhythm of the heart. The peak of the epidemic in1970 saw the introduction of cardio-pulmonary resuscitation (CPR). It involved, and it still does involve, external cardiac massage and intermittent inflation of the lungs. The defibrillator was invented, by Dr Frank Partridge and Professor John Anderson at the Royal Victoria Hospital, Belfast. The first models were very large, and I remember the first one that I saw and used in Manchester. There was just one for the hospital. It was large and on a trolley. Racing from one ward to another with it was dramatic and time-consuming. The next step was to concentrate the patients with MI on to a newly developed coronary care unit (CCU) so that cardiac monitoring would identify VF or other serious rhythm disturbances hopefully before the patient were to collapse, and then the specialist nurses, the doctors and the defibrillator would be available immediately. This was all new in 1970, the peak of the epidemic. As defibrillators became miniaturised, more of them could be placed around the hospital, and later outside the hospital in strategic community places, such as squash courts. In the final decades of the 20th century we would still hear of middle-aged men collapsing and dying while playing squash, but that does not seem to happen now. There is a great awareness of CPR in the community as a whole, and many people have attended CPR courses. I would imagine that the great majority of such defibrillators would not have been used, and they would be very intimidating to potential general pubic users. The other task is the identification of ventricular fibrillation. 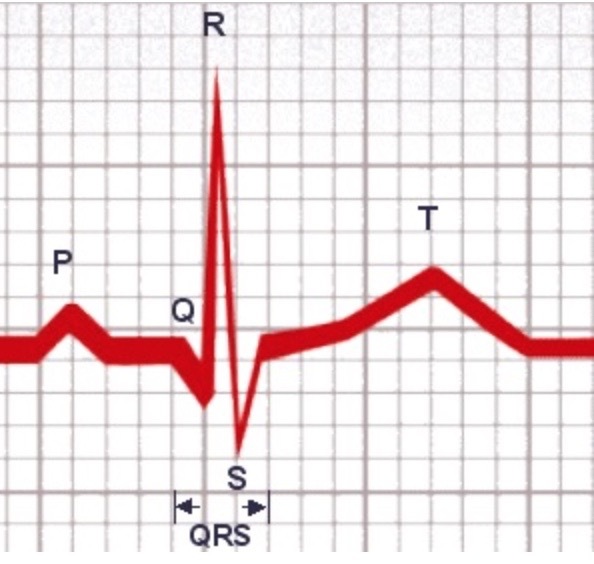 This initially required an ECG recording with immediate interpretation (Figure 8). Further developments of the defibrillator have included an active ECG recording, and later automatic defibrillation as the machine itself will identify VF. In the 1970s and into the 1980s, one of the dangers following an MI was “heart block”. The pulse would become very slow and the patient’s condition would deteriorate rapidly. What happens is a blockage of transmission of the normal electrical impulse throughout the heart, from the right atrium to the ventricles. This is due to damage to the conduction tissue that is embedded in the heart muscle. The atrial beats (P waves) occur regularly at a normal rate of about 70 per minute, but the ventricular beats (QRS complexes) occur in a detached way, and at a slower rate of about 30 per minute . It would be essential to increase the ventricular (pulse) rate back to about 70 per minute. The way to achieve this would be the insertion of a temporary pacemaker. This involves passing a wire through the veins from the ante-cubital fossa on the arm, the front part of the elbow from where blood samples are usually taken. 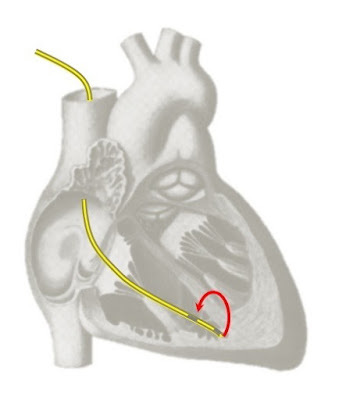 The wire is passed through the veins under X-ray screening until it is positioned in the apex of the right ventricle. The battery-powered pacemaker unit is then attached and a rate set, usually 70 per minute. The stimulus from the pacemaker gives regular ventricular pulsation. Many of these were used in the 1970s and early 80s. Heart block was a major and fairly frequent complication of MI. Usually the heart block recovered after a few days and the pacemaker wire was then removed. Sometimes there was no recovery and so a permanent implanted pacemaker was necessary. The senior resident staff of the hospitals became very skilled at inserting pacemakers, and would be undertaking about three procedures per week. But suddenly, at the end of the 1980s, the demand fell to about one per month, or then even fewer. This meant that outside the cardiology department no doctor had adequate training or experience. It was further evidence that MI was becoming a much milder disease. The numbers of patients with definite or suspected MI was greater than the new CCUs could accommodate. 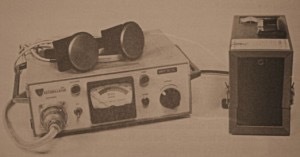 Many were on general medical wards, and as rhythm disturbances of the heart were common and recognised as important, cardiac monitors were frequently to be seen at the bedside. The patterns and bleeps were valuable to the doctors, and in addition they were intriguing to the visitors. Much more was necessary on the CCU other than awaiting and then reversing VF. The challenge was to prevent the occurrence of VF. There were various fashions for medical suppression of VF, using for example intravenous lignocaine. It fell out of use after a trial in 1972 showed that it had no advantage over just intravenous saline. Also intravenous glucose and insulin were used, given to stabilise heart muscle cells by increasing intracellular potassium. Subsequent research showed no advantage. Details of these treatments will be in a different Post. The decline of MI and CHD deaths. A major reduction of the incidence of MI has occurred, but most people seem to be unaware of this. It has however been clear, not just from national statistics (which perhaps few people read) but also from the observations of those in practice during the height of the epidemic. The reason for the rapid decline of deaths from CHD is not explained. In fact in 1978 there was a Bethesda Conference in the USA to try to identify the reason for the decline in CHD deaths. As a result the MONICA (Multinational MONItoring of trends and determinants in CArdiovascular disease) project was set up to search for an explanation . Twenty years later the report stated that the decline was the result of a decline in CHD events as well as a reduction in the mortality rate following a CHD event. That is as far as the explanation went . Professor John Hampton of the University of Nottingham, UK, reported in 1982 on the 25% reduction of mortality from CHD in the previous decade. He suggested that the reduced mortality rate was apparent before there were any substantial alterations to what were generally thought to be the causative factors, and certainly before the introduction of effective medical interventions . The reduction of death rate following MI at its peak in about 1970 was clearly remarkable. MI became not only a less common, but also a much milder disease. What newly qualified doctors see in the hospitals today is just a shadow of what I saw in 1970. We can see this below. 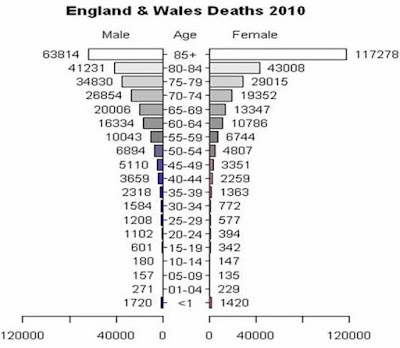 Figure 14 shows the present mortality pattern of the population of England and Wales. It comes as no surprise that the older we get the more likely we are to die. However things were very different in 1968, at the time described in this post and when I was first working as a young doctor. 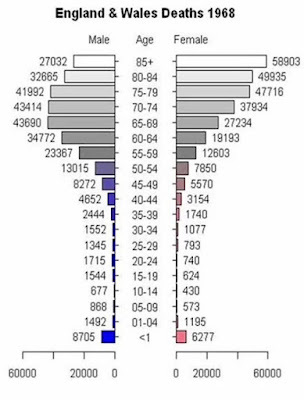 We can see in Figure 15 the huge bulge of male deaths between the ages of 40 and 80 years, and a less pronounced bulge in the death profile for women. The disappearance of the bulge of deaths in adulthood is due to the disappearance of CHD as a major cause of death in this age-group. Most CHD deaths are now above the age of 85. Why did CHD become milder? Why did it decline? Why is it now so uncommon below the age of 80 years? Where did it come from? There is no acknowledged conclusion but I will present the possible explanations in a future Post. 1. Wilcox RG, Roland JM, Hampton JR. Prognosis of patients with "chest pain ?cause". Brit Med J 1981: 282; 431-433. 2. Dalen JE, Alpert JS, Goldberg RJ, Weinstein RS. The epidemic of the 20th century: coronary heart disease. Amer J Med 2014: 127; 807-812. 3. National Institutes of Health. National Conference on Health Research Principles, 3 and 4 October, 1978: conference report. Bethesda, Department of Health, Education, and Welfare. Public Health Service, National Institutes of Health, 1978. 4. Tunstall-Pedoe H, Kuulasmaa K, Amouyel P, Arveiler D, Rajakanyas AM, Pajak A. Myocardial infarction and coronary deaths in the World Health Organisation MONICA project. Circulation 1994; 90:582-612. 5. Stewart AW, Beaglehole R, Fraser GE, Sharpe DN. Trends in survival after myocardial infarction in New Zealand, 1974 – 81. Lancet 1984; 324:444-446. 6. Hampton JR. Falling mortality in coronary heart disease (editorial). Brit Med J 1982; 284:1505-1506.